Last week's weather gave us all quite a chill. We even turned on the heat. And today, the high is 75. Go figure. But, I will say I wore my most recent sweater purchase multiple times last week. Maybe once more than I should have but I really love this sweater. It's perfectly oversized and roomy but warm and cozy. Is that not the purpose of a perfect sweater? For some olive sweater inspo, I bring you these picks, all from j.crew because they are killing it in the sweater game this season! 1. This tunic style pullover had me at hello, beautiful. I love the oversized nature of it with the contrast of the slimming vertical line down the center. I can see this with a great pair of leather leggings and some killer booties. 2. 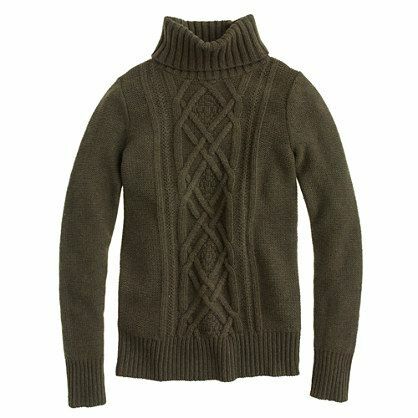 Ah, the cable knit turtleneck, one of my favorites! I live in them (for the purposes of fashion and function- it's freezing here most of the year!) This is the perfect chunky knit. And while the ivory is the classic, obvious choice- why not spice it up with the olive color way?! This, jeans, and some flats- very Olivia Palermo. Can't you envision her walking her dog in such an ensemble? 4. A sweater with side zips? Have you ever seen such a thing? I hadn't until recently. I love combo of the brass hardware with the soft, flowing knit. And hey, if you begin to overheat, just unzip. How practical. Or let a pop of color out- very j.crew! Happy sweater weather- I trust anyone will look good in these four fab picks!